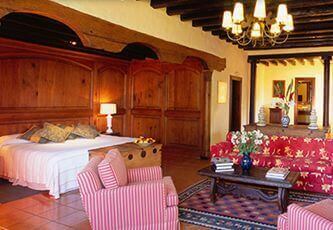 Villa Montaña overlooks majestic Morelia, “the aristocrat of Mexico´s colonial cities” and capital of Michoacan. A gem for years, this classic hotel distinguishes itself by combining the elegance of times past with modern luxuries and services, such as its newly opened spa. Business and leisure travelers alike will truly appreciate this luxurious property. 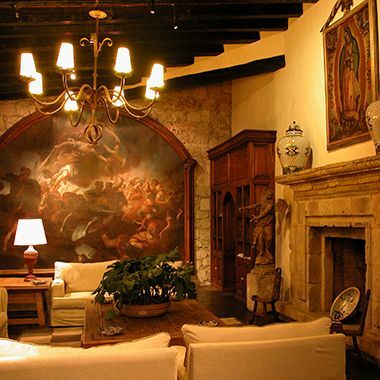 Villa Montaña, is situated in the beautiful city of Morelia in central Mexico. Because of the aristocratic faded rose hue of the stone quarried in the area, the city of Morelia is a baroque symphony in pink. Five minutes away, on the slope of the Cerro de Santa María, the view of Villa Montaña, a colonial gem, is awe-inspiring. 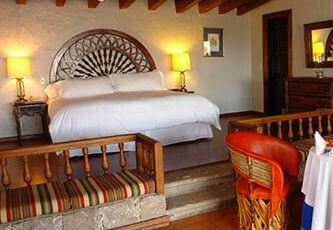 And even more so when it is enjoyed from a cozy bar or the delightful crystalline waters of a heated pool. 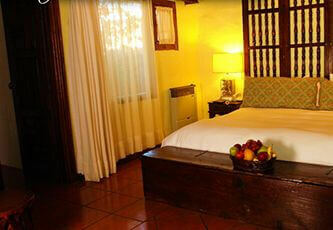 Villa Montaña has 36 suites spread among small casitas surrounded by lovely gardens. 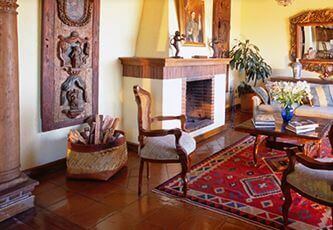 Villa Montaña is the expression of a lifestyle frozen in time. Resulting from a combination of architecture, decor and service, this boutique hotel captures the atmosphere of a Mexican hacienda from the first few years of the 20th century. Behind the raw stone or deep-red stuccoed walls of the casitas, the rooms feature heavy wood furniture that contrasts with either delicate French accessories or fine European antique objets d´art. Morelia is a beautiful destination and many of its surrounding towns are worth visiting, where you will find some of Mexico´s most outstanding handcrafts. Bring a large suitcase! Fireplaces take care of cool nights, while sunny days may be enjoyed on the private terraces where multicolored azaleas in huge clay pots compete with the lilac blossoms of the majestic jacaranda trees. Throughout the construction, solid columns support wooden beams that are repeated in the ceilings. At the restaurant, with a background of live piano music, exquisitely presented dishes mix fresh seasonal ingredients with traditional or international recipes and tons of talent. Everything at Villa Montaña spells relaxation and luxury, and, although leaving this haven may be unthinkable for some, those who decide to venture outside may visit the city, the lakeside town of Pátzcuaro or the forest where Canadian monarch butterflies spend the winter. All rooms feature fireplace, vent, iron, ironing board, nespresso coffee maker, TV, safety deposit box and direct-dial telephone. Spacious bathrooms have shower-bathtub, hairdryer, extension telephone, bathrobes and complimentary slippers. Spacious, with either one king or two double beds, sitting area with fireplace, garden or city view. Very spacious, one bedroom with king bed, living room with fireplace, garden and panoramic city views. 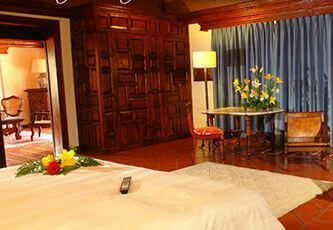 Luxurious, one bedroom with king bed, living room, some with fireplace in both, garden and city view. Master bedroom with king bed, second bedroom with two full beds. Both bedrooms have fireplace, TV and bathroom with shower-bathtub, hairdryer and extension telephone. The spacious living room has a private terrace with garden and city views. Large bedroom with king bed, fireplace, desk, spacious bathroom with shower-bathtub, extension telephone and generous amenities, living room with fireplace and adjoining dining area. The large private terrace has furniture for tea or cocktails and a panoramic view of Morelia. No penalty will be charged for cancellations received 3 days or more prior to arrival date during the regular season. During the following holiday periods, cancellation must be received 7 or more days prior to arrival date: Day of the Dead: Oct 30 – Nov 3 Christmas and New Year: Dec 19 – Jan 3,2012 During all seasons cancellation penalty of one night plus taxes will be applied to credit card No-shows will be charged one night plus tax to credit card. No charge will be applied to early departures. Use of tennis courts and Gym. 18% tax and 5% service charge not included. Additional person: $15 USD. Children under 12: no charge. Additional bed: $30 USD. Master Suite rate is based on quadruple occupancy. Transportation from Morelia International Airport costs adittional cost. The trip is approximately 45 minutes. “Experience the Seven Pillars of Well-Being: philosophy, beauty, harmony, water, vitality, life balance, nature and nutrition.”Our spa is a unique haven, a place to relax and be royally pampered by a highly professional and nurturing staff. Villa Montaña Spa is your passport to a healthier lifestyle and a mind and body in exquisite balance. Here is a world of serene beauty, far away from stress, dedicated to calming peace.In an over-stressed world, peace of mind combined with a fit body is the essence of health. The elusive harmony of mind, body and spirit is more attainable than you think!When was the last time you let go of your responsibilities and devoted time just for yourself? The constant stress of moving in fast-forward, with no break, can wreak havoc on your energy and health. We invite you to come and catch your breath, find your balance again and just enjoy.Our vision is to create an environment dedicated to wellness and beauty through the use of Old World philosophies, healing with human touch. An environment free of toxins and synthetics. For body treatments, we use Kinich products. Kinich (Mayan word meaning face of the sun) is a full line of advanced phytodermal cosmetics derived solely from plants and offers health and beauty experts all that is necessary for a broad number of treatments, such as thalasso therapy, geotherapy, aroma-chromium therapy and phytotherapy. Kinich is a Mexican cosmetics line that takes advantage of the ancestral benefits of Mexico´s traditional medicine, which is one of the richest and most diverse in the world. It includes aloe, cactus, prickly pear, cuachalalate, guava, tepezcohuite, tamarind, alfalfa, peanut, vanilla, amaranth, coffee, chili pepper, and beehive products such as honey, royal jelly, pollen and propolis. For facial treatments we use Germaine de Capuccini products. Germaine de Capuccini is a Spanish firm in the skin care products sector that offers only the best for skin hydration, refreshment, repairing, aromatherapy, smoothing, relaxation and daily protection. For massages we use Hydro Basics, a Swiss firm. Hydro Basics gentle and ultra-effective body care derives its power from water with the added benefits of seaweed extracts. Enhanced with refreshing essences of lemon and green tea, this water-based spa line offers new energy to replenish your mind, body and soul. Villa Montaña also has a Flotation Chamber that creates an optimal environment for lucid dreaming, meditation, relaxation, stress relief and more. It keeps all light out and minimizes all sound. The chamber is filled with a large amount of salt and a small amount of water, creating maximum buoyancy and the sensation of floating in space. This is a sensory deprivation environment in which there is the least possible amount of physical, visual and auditory stimulation. We also offer sauna and steam room sessions. Guests may use the sauna for bathing, as well as for mental and physical relaxation. One purpose of the steam room is to relax the client´s muscles and hydrates their skin before being massaged. When muscles are thoroughly warmed, they are much more relaxed and react more responsively to massage therapy. Some benefits of sauna and steam therapy are: Relaxes the body Increases the effectiveness of massage An incredible feeling of vitality and well-being Helps stop detoxify the body Cleanses the skin Helps to clear sinus passages and reduce the effects of colds Helps the body recover from strenuous exercise Helps to reduce the effect of sunburn Well-equipped ladies´ and mens´ showers with the best amenities (Hydro) are also part of Villa Montaña Spa. Relax at the spa´s front desk while reading a magazine, enjoying the smell of relaxing oils and listening to the crackling fireplace. It is important to note that we use a variety of products and lines for different treatments because we choose only the best of each to pamper our guests. The world-renowned restaurant offers an ample menu consisting of fine international and Mexican dishes. Our desserts have made us famous. Live piano music. The bar offers a splendid panoramic view of the city of Morelia, a wide variety of cocktails and domestic and imported wines and spirits. Live music complements the ambiance.